We make our own soap. We use fragrance and essential oils. We will be updating these from time to time as we try new things. Please check back periodically. Or email us if you are looking for something specific. Receive one glycerin oval soap bar made with Jasmine fragrance oil & colorant. Each bar weight is 3 ounces. Soap is packaged and sealed in a cello bag and labeled. Package comes in an organza bag. Receive two glycerin soap bars made with fragrance oil & colorant. Each bar weight is 2 ounces. Receive one glycerin soap bar made with fragrance oil & colorant. Lot of thirty (30) clear glycerin soap scented with various scents. These lil' soaps are the excellent size for a half bath or right at your kitchen sink. Total weight 3 ounces. Receive one red glycerin, two-tone red/white glycerin/goat's milk, or white goat's milk soap bar made with Dragon's Blood concentrated essential oil & colorant. This is for a beautiful and wonderfully fragrant whole loaf (uncut). It is approximately 5- 1/4" long by 2-3/4" wide at the base. At the top, it is approximately 5" long by 2-1/4" wide. It is approximately 1-3/4" tall. Receive one goat's milk soap bar made with fragrance oil & colorant. 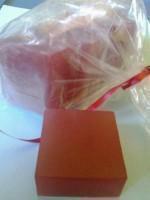 Receive four 2 ounce bars of glycerin soap with the sandalwood scent and red colorant added. Total weight of soap is 8.5 ounces. The bars are individually wrapped in cellophane.